At the beginning of November, I put together a very thorough review of the DiNotte 200L-AA-S headlight. DiNotte’s lights have been praised by commuters, tourers and randoneers alike because of their long run time, ample light output and intuitive and flexible battery solutions. I’ve now been using the DiNotte 200L for about three and a half months. This light has withstood torrential downpours, single digit temperatures, lots of exposure to sunlight, and abuse on the trails. Add to that the temperature swings between cold winter days outside and coming indoors at night. Indeed, year-round commuters are hard on bikes and all the accessories on them. About a month ago, one of my battery holders stopped working. A wire broke near where the light plugs into it. This caused the DiNotte to flake out on occasion or just fail to power up. Needless to say, that’s not acceptable. A full charge gives me over 3 hours of full-brightness light. The only time I’d need to use the backup battery clip was if I was on an exceptionally long ride or I had forgotten to charge the batteries after a few days of use. I ended up keeping my spare batteries in a bag with me, but I wasn’t looking forward to the inconvenience of swapping them out one at a time. You can order battery holders from DiNotte, but you’ll end up waiting for them and paying for shipping. 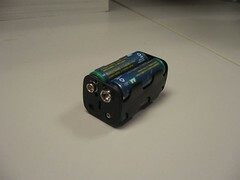 A compatible version is sold at Radio Shack for $1.79 (Catalog #270-383), with the 9V-style connector and all. If you start having problems with your battery holder, there’s likely one waiting at a store within riding distance for under $2. One thing that really sets the DiNotte apart from other lighting solutions is the simple, elegant use of an O-Ring to mount the light engine. The massive temperature swings combined with mounting the DiNotte on various different sizes of handlebars and on my helmet has caused the original O-Ring to lose some of its elasticity. It no longer firmly grasps the handlebars on some of my bikes. The easy fix was to simply introduce a twist or two into the O-Ring before slipping it over the front of the light engine. 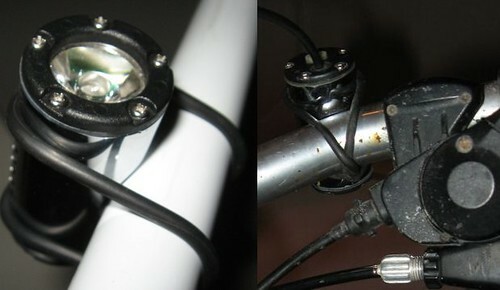 The photo on the right shows the “correct” way to attach the O-Ring. The second photo shows how I managed to take up some of the slack in the aging O-Ring by twisting it so that it once again stays where I point it. Overall, I’m still really pleased with this purchase. Its strobe modes and bright white beam color provide daytime visibility. At night, its maximum light output is on par with a 10W halogen bulb but with a considerably longer run-time. As far as the durability of the light itself, it’s still working flawlessly despite all the abuse I’ve put it through. If you’re in the market for a light with these features, I can’t say enough good things about the DiNotte products. Thanks, Noah, for the original review and the “quick fixes.” I just ordered the Dinotte 200L-AA from REI today, based partly on your review……. Nice call on the battery holder, I bought both a taillight and headlight, I have been having trouble with one or the other shutting when I ride over rough roads. I thought it was the connectors, but have finally decided it is one of the wire springs with too much give in it. I’ll be heady to radio shack tomorrow. I bought extra battery holders when I got the lights (tail and headlight). One of them quit working within a month, there is a loose connection where the light attaches (used a multimeter continuity check to find it). I had extras so I didn’t bother. Now two more quit working (looks to be similar problem), so now I’m short one holder. Either I’ll try soldering the connection or stopping by Radio Shack. Other than this problem they lights have been excellent. Well worth the price I pad. I still have my original Dinotte 200 AA from 2007/8? Only issue I’ve had with the battery pack is that one of the battery slots would jar loose. A heavy duty rubber band (#84) from Staples wrapped 3x around solved that issue.